If you’re shopping for a compact, single-serve blender that’s easy to use, there are two products you should know about: the Magic Bullet and the Nutribullet. Both products are produced by Homeland Housewares, but designed for different uses. While they sound very similar and even look the same, there are some notable differences in function and quality that you should consider. In order to choose the best blender for you, you’ll need to do a complete and thorough Magic Bullet vs Nutribullet comparison. Magic Bullet vs Nutribullet: Who is the Winner? The Magic Bullet and Nutribullet are both versatile, compact blenders used for blending and mixing various ingredients for smoothies, shakes, juices and sweet or savory recipes. They both have rounded, oval-shaped jars designed for crushing and pulverizing fruits and vegetables for maximum nutrient extraction. Neither of them have buttons or complicated instructions; they work by simply pressing down on the cup. This is an incredibly efficient way to quickly blend drinks and meals without much effort. They can both provide a means to create healthy, nutritious drinks and recipes that are fun, tasty and easy to digest. By consuming fruits and vegetables that are blended and pulverized, your body can absorb nutrients more quickly without having to spend extra time breaking down the food. Both blenders are great for home cooks, chefs, athletes and anyone who enjoys making fun and healthy blended drinks and meals. Bullet blenders are meant for single serve use (for one or two people); they’re not ideal for making recipes in very large batches at once. The way you use them is generally the same; read on to learn how. Loading the IngredientsTo use your bullet blender, take the cup and add in your desired ingredients. Since you’ll be flipping the cup upside down, you’ll need to add the ingredients backwards to what you would in a normal blender. Add in the solids first, such as fruit, vegetables or ice. Second, add in “middle” ingredients, such as yogurt, protein powders or chia seeds. Finally, pour in your water, milk or juice. Make sure to not fill past the designated line on the cup. Preparing the BlenderTake the cap with the blade and screw it onto your filled cup tightly. Turn the cup up-side-down and lock it into the blender according to the instructions. In general, all you really have to do is twist it in and align it with the tabs on the base of the blender so it’s nice and secure. BlendingTo blend your ingredients, press down on the cup gently. To figure out how long you should be hold down your cup, check the instructions based on your ingredients. For softer ingredients, you won’t need to hold it down for very long (about a minute at most). For thicker ingredients, you may need to blend for several minutes. ServingWhen the ingredients are blended to your desired consistency, release the cup from the base of the blender and carefully untwist the cap. If you have one, you can put on a re-sealable lid, pour into a to-go cup or drink in a glass or mug. CleaningTo clean your Magic Bullet or Nutribullet, simply pour warm water into the cup until it’s about a quarter full, then add a tiny bit of dish soap. Put the blade cap back on and pulse the mixture a few times, rinse out and let dry. Both products are also dishwasher safe. In general, the Magic Bullet is a lower powered blender at a much lower price point. The Nutribullet is a much more powerful, expensive blender designed to crush tougher ingredients. 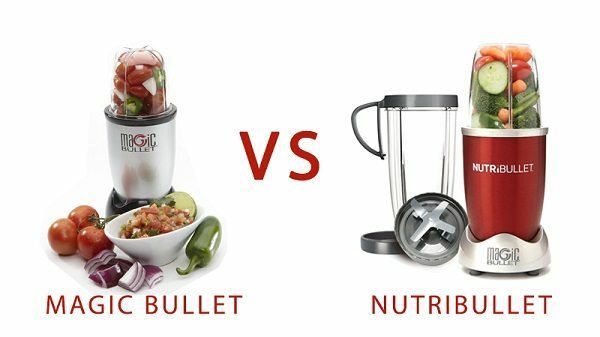 Let’s now compare the major differences between the Magic Bullet and the Nutribullet by getting into finer details. Magic Bullet: The Magic Bullet runs at 250 watts. It’s great for blending soft ingredients, such as bananas, fresh berries, yogurt and avocado. However, it’s not powerful enough to do a good job blending harder, frozen ingredients such as frozen fruit or ice cubes. Nutribullet: The Nutribullet is much more high-powered compared with the Magic Bullet, having 600 watts instead of 250. The Nutribullet is much more suitable for blending hard or frozen ingredients and milling dry ingredients, such as nuts and oats. Magic Bullet: About 2.3 pounds by itself; 4.7 pounds as a packaged product. Nutribullet: About 3.6 pounds by itself; 7.65 pounds as a packaged product. Comes with additional blades, including an extractor blade for chopping and blending “hard” ingredients (such as onions or fruits with seeds) and a milling blade for grinding hard foods, such as coffee and spices. In this video, you’ll see a visual comparison between the Magic Bullet and the Nutribullet. Both blenders are tested with fibrous vegetables and frozen fruit. The Magic Bullet smoothie came out somewhat chunky and grainy, while the Nutribullet smoothie was much more uniformly blended. Further in the video, you’ll also see that both blenders can efficiently blend protein and ice cream shakes, depending on your personal preference for texture. The winner is based on what you need it for and how much you’re willing to spend! While both the Magic Bullet and the Nutribullet are produced under the same brand, the Magic Bullet is a low-cost blender for mixing the basics. Alternatively, the Nutribullet is a more high-powered machine for pulverizing a greater variety of shakes, soups, smoothies and other blending recipes. You’re not looking to spend a lot on a blender. You’re happy making basic juices, adult drinks, shakes and smoothies with fairly soft ingredients. You want something lightweight that comes with additional cups and more color options. You make a lot of chunky blended recipes, as opposed to smooth. You’re just starting out on the smoothie craze and looking for something to help you learn the basics. You don’t mind spending more for something with lots of power. You want to be able to blend with various ingredients, including frozen foods and ice cubes. You want something with a couple of blade options and a pocket nutritionist. You need something that can process foods thoroughly and smoothly. If you want a blender to help you make more advanced and creative recipes, aside from basic smoothies. Don’t be afraid to pay more for a Nutribullet if you really want to make silky blended recipes that are smooth and even. However, if you’d just like something to mix your drinks or make chunky recipes, a Magic Bullet is a more affordable option. When it comes to Magic Bullet vs Nutribullet shopping, consider your long-term needs!